Sports related concussions are commonplace. Some have higher rates than others and the NCAA is no different. A new study of 5 years of data released by the NCAA shows which sports have higher rates than others. Concussion happens when the head has a severe impact that the cerebrospinal fluid, (which protects the brain from light trauma), can’t protect. It can be caused by a blow to the head, or even a hard body blow that makes the head snap forward or backwards. Those who have had one concussion can be more susceptible to another and studies have found that repeated concussions can increase the risk of brain illnesses such as dementia or Parkinson’s disease later in life. Concussions can be symptom free, or include headache, loss of consciousness, amnesia, feeling cognitively “foggy,” slowed reaction times, balance issues and sleep disturbance. The NCAA study revealed that men’s wrestling has the highest rate of sports related concussion, with football following right behind. Interestingly, when men’s and women’s sports were compared (apples to apples, i.e. men’s lacrosse to women’s lacrosse, men’s basketball to women’s basketball, etc.) women athletes tend to have higher rates of concussion than men. The studies showed that overall, the rate of injury for students between the 2009-2010 school year through the 2013-2014 school year was 4.47 per 10,000 athlete exposures. That comes out to about 10,560 concussions annually, and that 1 in 11 were recurrent concussions. That was the average for all sports. When specific sports were studied, the numbers were even more interesting and gave some insight into what the main cause for sports seemed to be. Researchers who noted the differences between men and women in the same sports contributed to the differences in rates to greater angular rotation and head-neck segment peak acceleration and displacement in women, weaker neck muscles, and the possibility that female athletes are more likely to report concussion than their male counterparts. 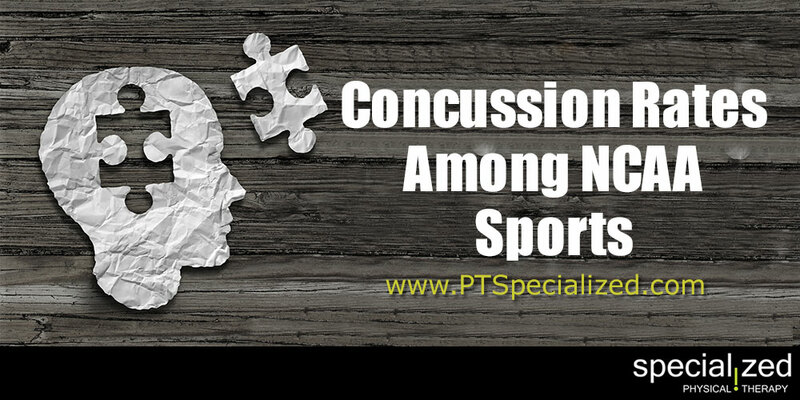 They also found that overall player-to-player contact as the leading cause of concussion. Fortunately, the study can be used by sports trainers and physical therapists to help athletes strengthen themselves in ways to avoid concussion and it’s long term effects. How Can a Physical Therapist Help with Concussions? Rest and Recovery. Your physical therapist will help you and your family understand why you should limit any kind of activity (physical, sport, recreational, electronic, school) after a concussion, until it is safe to return to these activities. A period of rest helps the brain heal and helps symptoms clear up, as quickly as possible. Your physical therapist will prescribe the rest and recovery program most appropriate for your condition. Restoring Strength and Endurance. The physical and mental rest required after a concussion can result in muscle weakness, and a decrease in physical endurance. Your physical therapist can help you regain your strength and endurance, when the right time comes, without making your concussion symptoms worse. Your physical therapist will design a therapeutic exercise program just for you, and closely monitor your symptoms as you participate in the program. Stopping Dizziness and Improving Balance. If you have dizziness or difficulty with your balance following a concussion, a type of physical therapy called vestibular physical therapy may help. The vestibular system, which includes the inner ear and its connections with the brain, helps you keep your balance and prevent dizziness. A qualified vestibular physical therapist may be able to help reduce or stop your dizziness or balance problems after a concussion by applying special treatments or teaching you specific exercises. There even may be some simple exercises that your physical therapist can teach you to do at home. Reducing Headaches. Your physical therapist will assess the different possible causes of your headaches, and use specific treatments and exercises to reduce and eliminate them. Treatment may include stretches, strength and motion exercises, eye exercises, hands-on techniques, like specialized massage, and the use of technologies such as electrical stimulation. Returning to Normal Activity or Sport. As symptoms ease and you are able to regain your normal strength and endurance without symptoms returning, your physical therapist will help you gradually add normal activities back into your daily routine. Your physical therapist will help you avoid overloading the brain and nervous system, as you increase your activity level. Overloading the brain during activity after a concussion interferes with the healing of the brain tissue, and can make your symptoms return. Your physical therapist will help return you to your normal life and sport activities in the quickest and safest way possible, while allowing your brain to properly heal.